Where did we leave off? Oh yes, I had just enjoyed a delicious Italian pre-race meal and called it an “early night” which, for me, was 11pm or so. You can read about the pre-race festivities here. 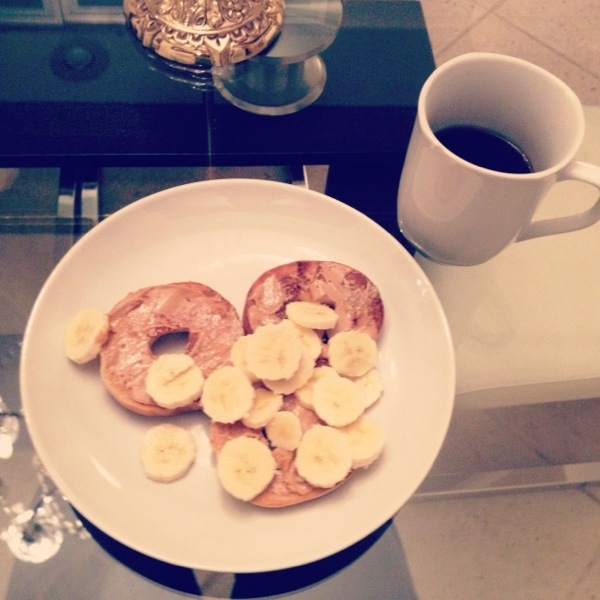 I got up bright and early on race day Sunday at 5:30am to eat a pre-race breakfast. I normally do a bowl of oatmeal with chia seeds and some kind of fruit or the standard PB on toasted bagel. At the store I snagged some mini bagels and toasted 1.5 of these, topped with peanut butter and sliced half of a banana. Enjoyed this with a mug of coffee. After dilly dallying a bit, I hopped in the shower to wake myself up. No hair wash, of course. Do you take showers pre-race? It helps energize me and wakes me out of my too-early-in-the-morning funk. Woke up my sweet guy from his sleep and had him drive me just a mile or so down to the start line area. Yes, it’s just a mile but I didn’t feel like getting chilly and walking too much before the race. 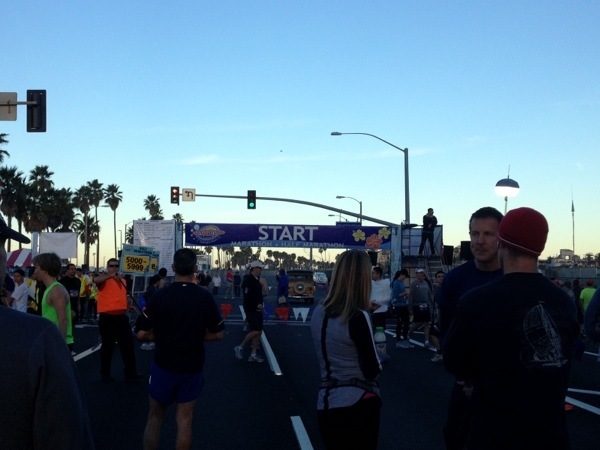 The view as I got to the start line was so beautiful. It was perfectly cool for the race start. I stretched, listened to music, and enjoyed the excitement around me. 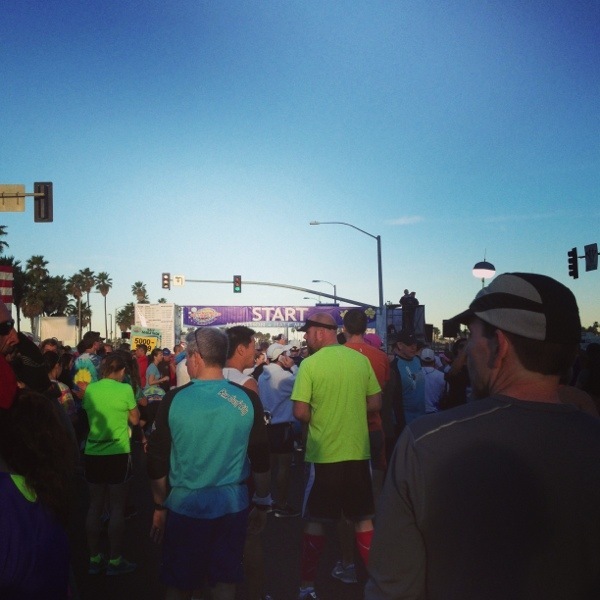 At around 7:45am, my corral 2 was off and running! I’d recap this race by letting y’all know what my mile splits were, but nope. My Garmin 305 decided to die on me and lost the satellite signal. I think it’s pretty dunzo. Can’t wait for my Bia GPS Sport Watch to arrive this spring! 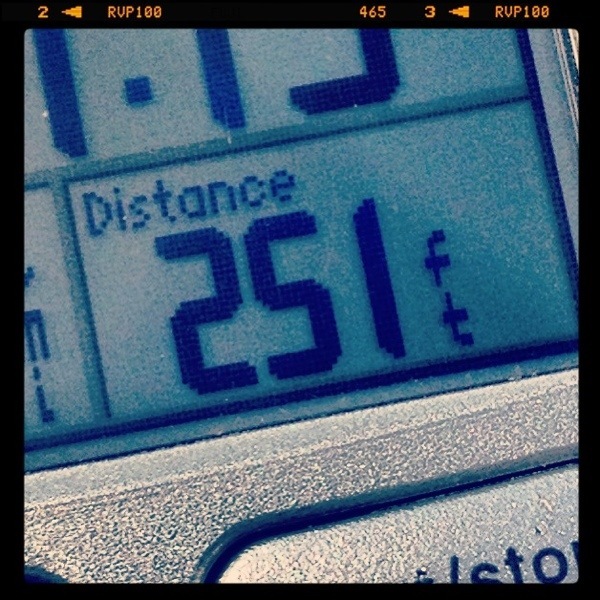 It wouldn’t say that I only ran 251 feet. In addition to the GPS disaster (I wear my Garmin religiously so running without paces, etc. was like running naked to me), I had severe shin splints for the first 5-6 miles. Sadly, I was wearing my Zensah compression sleeves like usual. They didn’t do me any good. 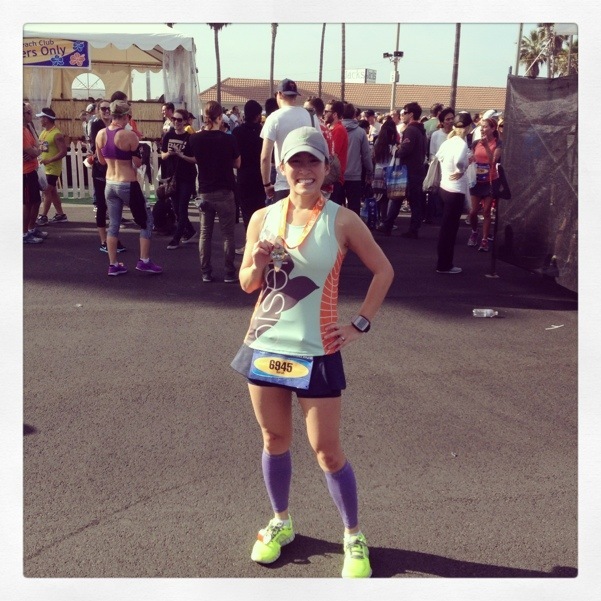 I’m going to get some CEP sleeves instead for future races. 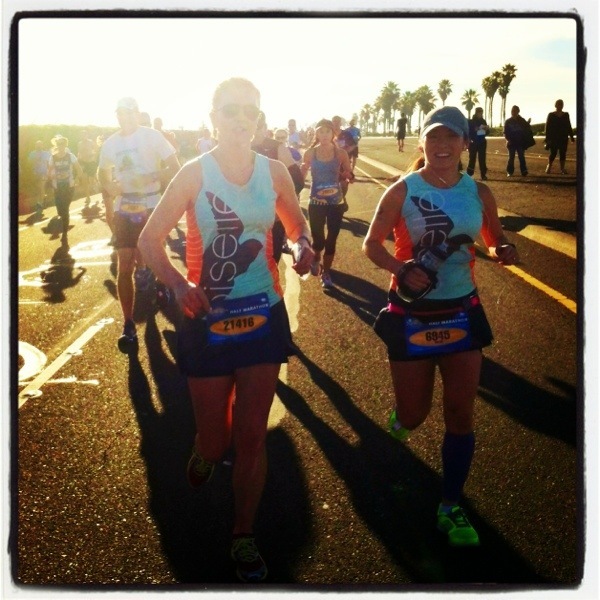 Into the first few miles, my Oiselle teammate, name & outfit twinsie, Sarah, ran up to me. 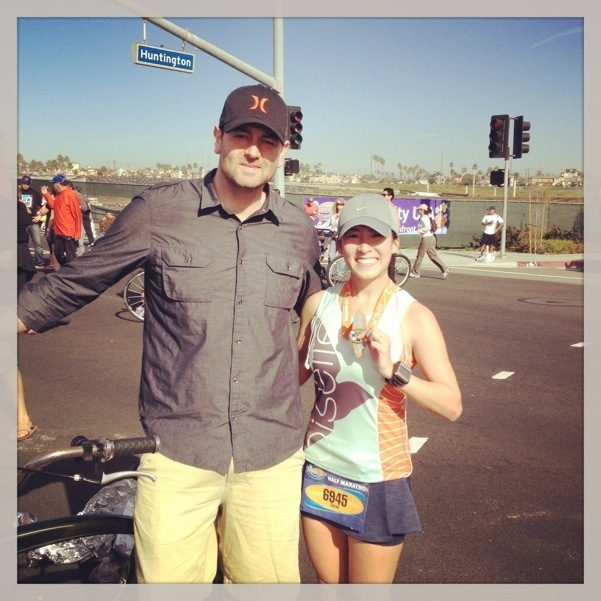 Check out her blog recap of the race. I was in pain already a few miles in and waved her off to keep on going. There was no way, in my mind and body, that I’d be able to keep up with the way my shins wanted to keep me down. Picture snapped by Sheila and Instagrammed by me. After 5-6 miles of running, I had my Chocolate Outrage Gu and felt better. I was holding my handheld water bottle filled with Nuun Fruit Punch electrolytes and steadily sipped away to stay hydrate during the entire race. My legs felt better after mile 6 and I felt myself pick up the pace. The course was gorgeous with 9 total miles of oceanfront views. Definitely a scenic, beautiful place to be. The race is said to be very flat, but I personally found it to have some unexpected hills/inclines. 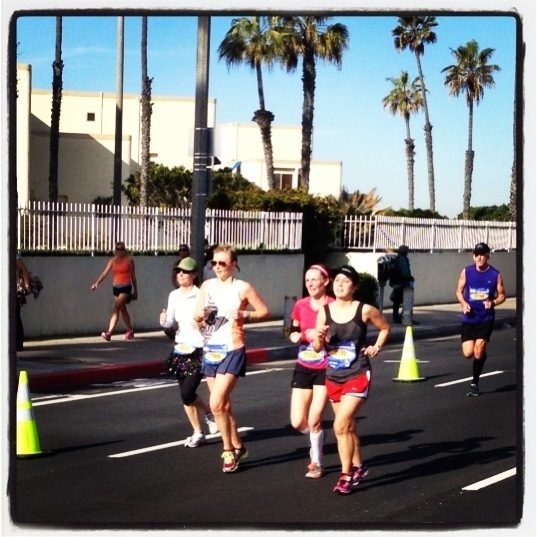 Particularly in the last few miles of the course, I found myself running what seemed like an eternity uphill. The sun started beating down with temperatures getting to above 70. My Pacific Northwest running body was not used to this and felt the heat penetrating me, making me sweat profusely. I started taking my Honey Stinger gummy chews every mile. They definitely helped energize me for the last few. Kept running for what seemed like eternity… then, finally, the end was in sight. I kicked it into gear as soon as I knew that I had only 1 mile left. With all I had left, I pushed forward and finished with an official time of 1:51:14 (8:29 pace). Around 6 minutes off away from my PR, but I’m still stoked about my unwillingness to give up despite the shin pain and temperatures. Of course, my cheerleader Joe was there to cheer me on to the end. Love you! Also love that he spotted my teammate in the distance and snapped this shot. 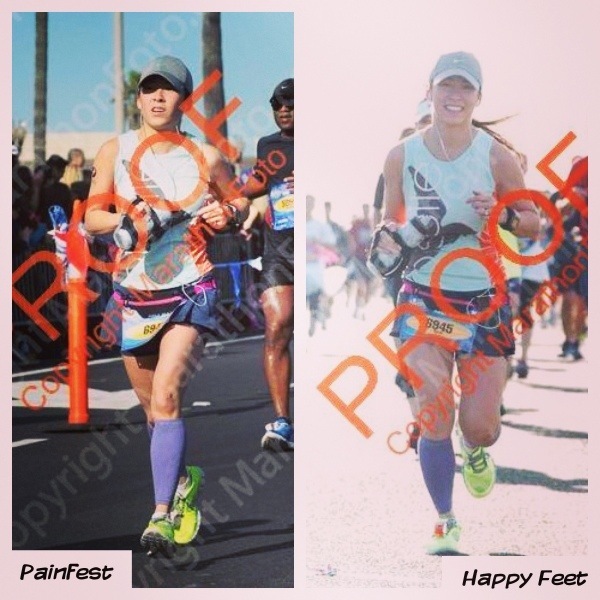 My 12th half marathon pride. After the race, Jay and Lindsay met up with Joe and I and we headed over to a popular place for breakfast called Sugar Shack Cafe. 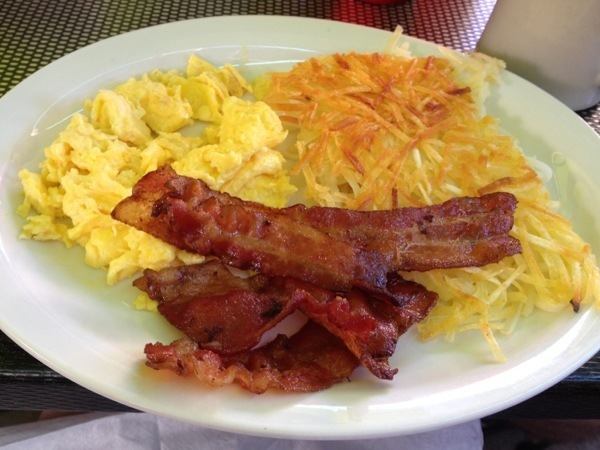 I scarfed down my eggs, bacon, hash browns, and toast in record time. We then proceeded to share a fish bowl filled with boozy cocktail at Sharkeez. Refreshing. 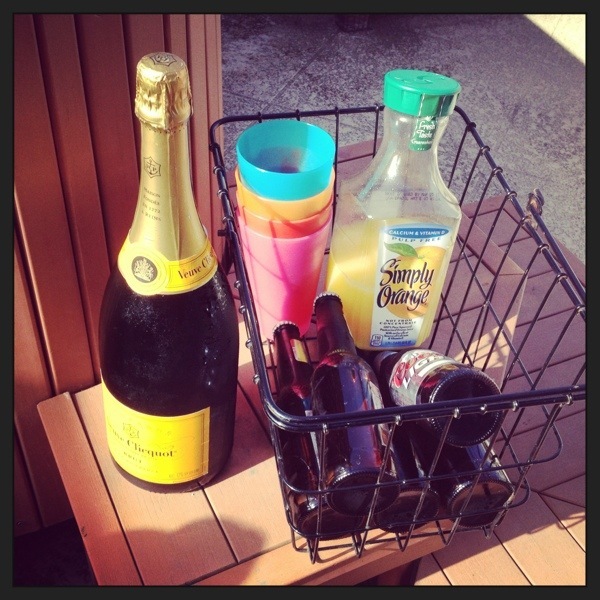 After this, we headed back to the house and hopped into the hot tub for some more refreshments before Super Bowl time. The Super Bowl, as you saw or heard about, was such a boring disaster… until, well, the end. 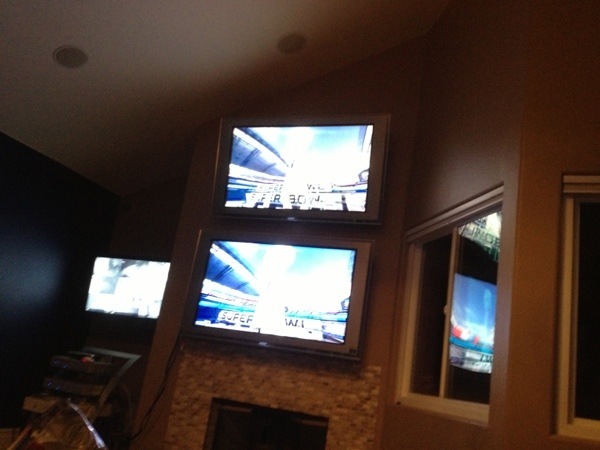 At least we watched it on two TVs in the living room! Seriously, who needs this many in one room? And….. I likely never need to eat another Doritos chip ever again. I ate way too many of those. 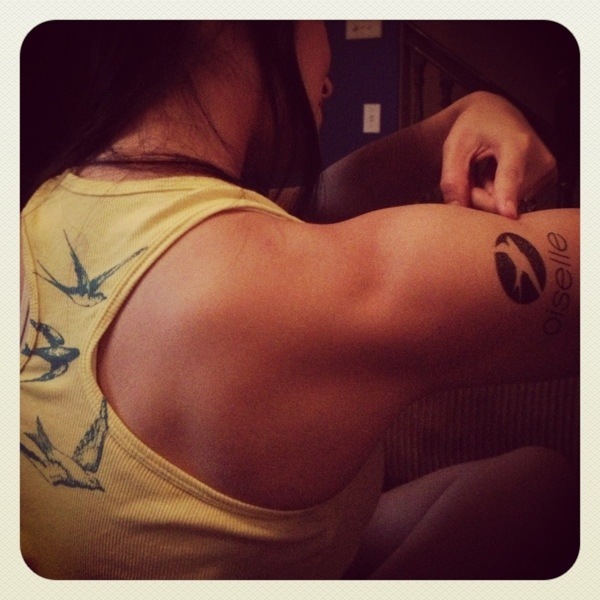 Check out my sweet Oiselle tat and Go Long Running Tank, perfect for layering. The next morning, we packed up and headed back over to LA to hang out for the day before our flight left in the late afternoon. 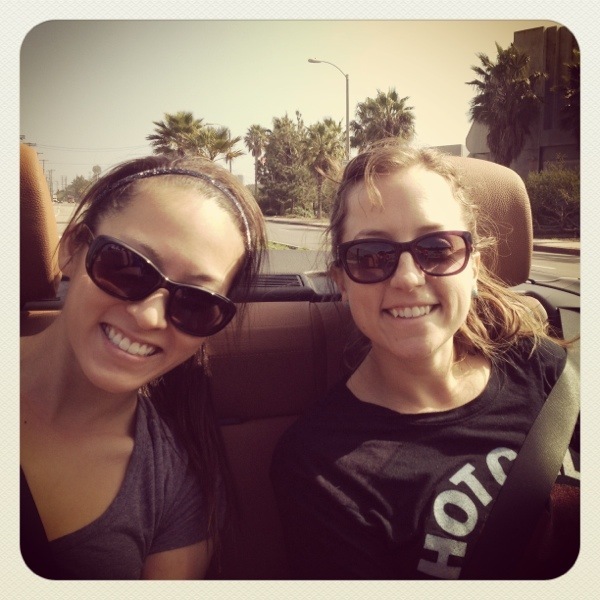 On the way to Hermosa Beach for some early afternoon fun, we had to ride Lindsay’s sweet car with the top down. Oh, California. For food, we made our way to Watermans, one of our favorite places for a casual bite or drink. 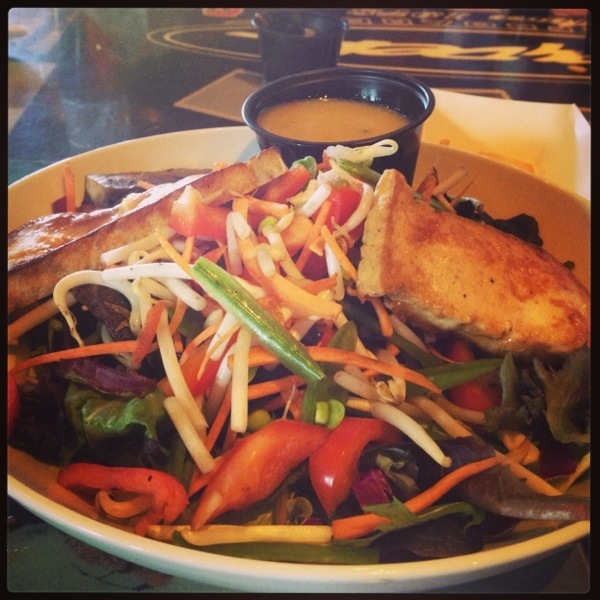 I had seriously one of the best salads of my life there for lunch that day — The Hippie. 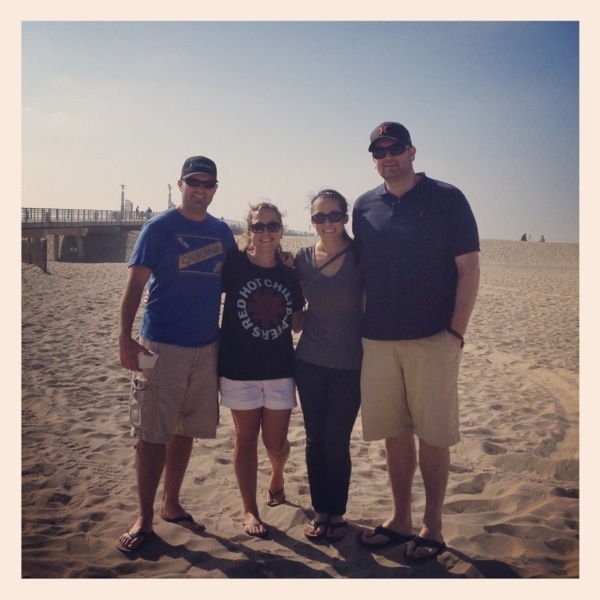 After Hermosa, we headed over to Manhattan Beach for one last beer. 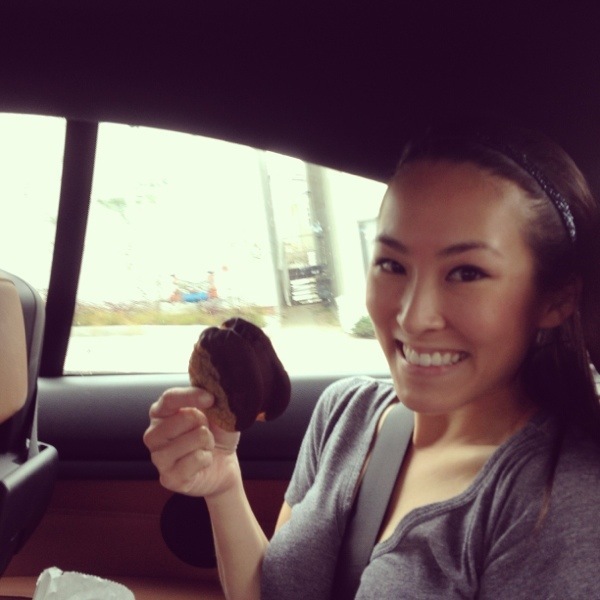 Right before we headed back over to the house to grab our luggage to the airport, I had an intense craving for ice cream. Well, this definitely fulfilled my needs. 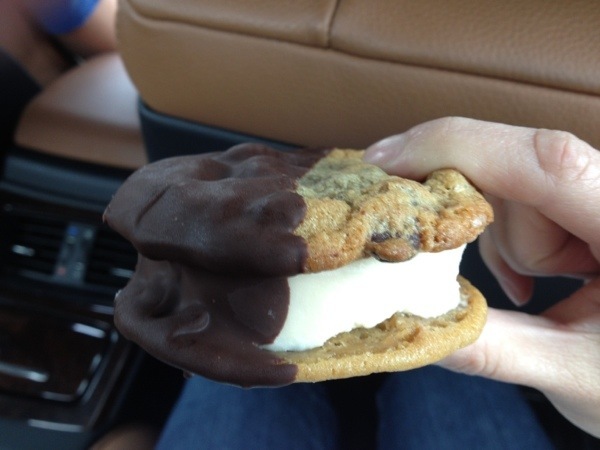 Best ice cream sandwich ever from Manhattan Beach Creamery. Seriously. The best. It was such a wonderful weekend of racing, new friends, old friends, food, and fun. All that I could ever ask for. Oh…. 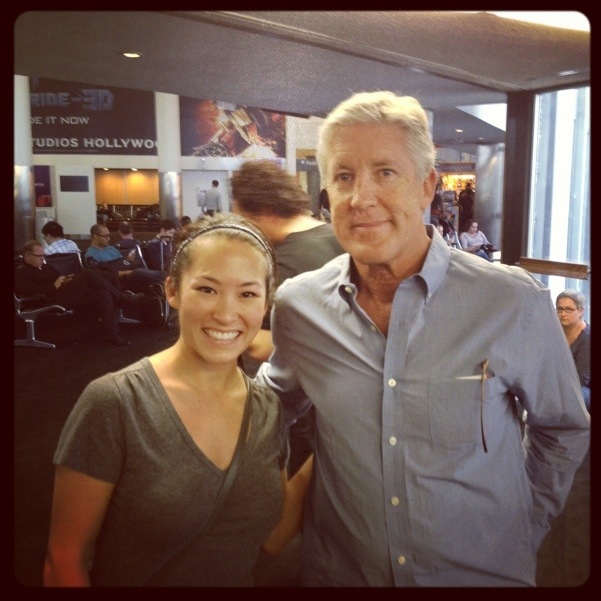 though at LAX, we spotted Pete Carroll who rode on the same flight as us back to Seattle. Two “celebrities” – Conan at Sea-Tac, Pete at LAX? Awesome. 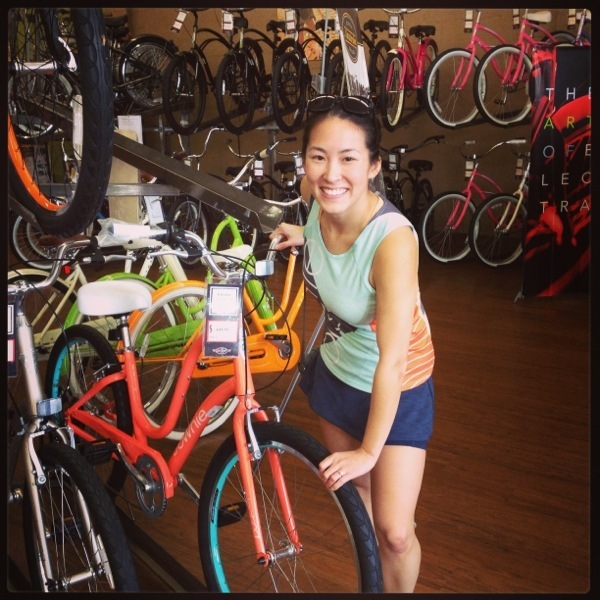 Before I forget, can someone please get me this awesome beach cruiser? Totally matches my Oiselle race singlet, doesn’t it?? 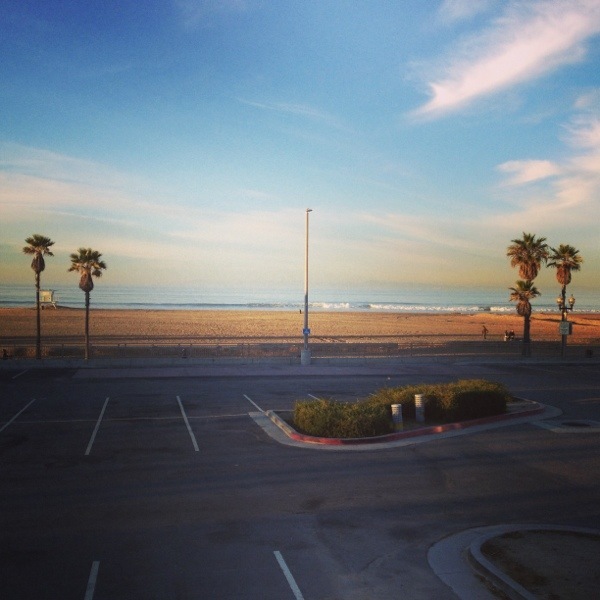 Surf City, like I said, was awesome but unfortunate shin pain was not ideal. Nor was the significant runners toe pain I felt for a week after the race. My toenail will most certainly be falling off. Sorry, TMI. Looking forward to Eugene Half Marathon at the end of April! Thank you!! 🙂 Yeah, when pain ever hits during a race, I wonder to myself why I put myself through it. But it’s because I love running! Pete was definitely on the flight sitting in first class. 🙂 So cool.